« Happy World Day for Audio Visual Heritage 2016! This entry was posted on Wednesday, December 7th, 2016 at 3:45 pm	and is filed under Audio Tape. You can follow any responses to this entry through the RSS 2.0 feed. You can leave a response, or trackback from your own site. 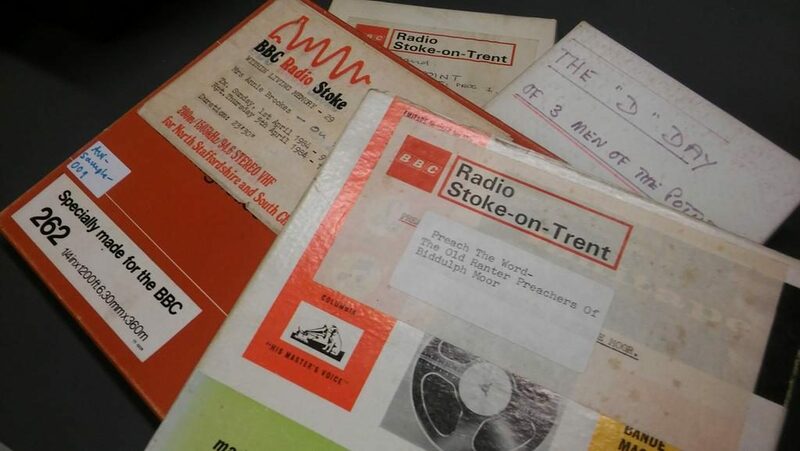 I collaborated with Arthur in the production of a radio-vision programme using local characters to bring French alive to schoolchildren in Stoke-on-Trent in about 1975. At the time, I believe this was the first time local radio had used radio/vision – we had filmstrips sent to schools to watch during the broadcasts. One episode featured players at Stoke \city football club who had acquired languages as part of their career. These tapes may not have much general appeal, but one of the spin-offs was when Arthur accompanied me to Limoges in 1986 on the occasion of the 10th anniversary of the Staffordshire-Limousin Exchange. We did voxpops and interviewed people who had taken part in the exchange. This was the first time local radio had done an OB abroad – or so we thought – from the continent. We were based in a large studio at ORTF Radio Limoges. It had a Steinway grand piano which inspired Arthur to write a jingle in French (“Limoges! Limoges, c’est ca que j’aime! Limoges! Limoges! Un cafe creme!) to introduce our programmes which went on for a week and included a commentary on a match between a Stoke Rugby team and a Limoges team, at the end of which the Potters presented a 15-handled chamberpot specially made for the occasion to the French team. I hope some of thee tapes survived and would be happy to help categorise them. I am fascinated by this project. I worked with Arthur for a year – 1975-76 seconded from my role as an English teacher to work on educational broadcasts. I have some tapes I would like to add – I haven’t been able to listen to them because I don’t have a reel to reel player. Please also put me in touch with Jane Wood. I would like to tell her how much her father meant to me.